A Painting Today: "100 Faces, No. 1"
I have this habit of equating food with painting. Let me give you an example - I lost 51 pounds in about a year's time and I've hit a plateau. The advise is to change it up, increase my exercise. Hmmm........ okay. Painting wise, I've hit a plateau. So I'm changing it up and increasing the exercises. Today I started a new series called '100 Faces' - a personal challenge to practice and study painting the human face. Good warm-ups to get the blood moving. My references are taken from mugshots all around the country. Where will you find your references? ?/ Do you have a ton of photos you've taken over time or will have find people to come in??? Wow, the modeling and colors are fantastic! Very well done. I love this idea. And I love this painting. Love this energetic portrait - this is going to be fun to follow. And congrats on the minus 51!!! Don't you love that it's gone? Good for you! Love the color and directional strokes. Looking forward to the remaining 99. I would love to follow this project. Saw your paintings at 16 Patton Gallery today; they are even more beautiful in person!! Congrats on your weight loss! Hi Karin. Nice portrait, a good motivation. What a great idea. I'm a great admirer of artists who constantly challenge themselves, it keeps ther paintings alive with passion and interest. This reminds me a great deal of Chuck Close's works and I absolutely love it! Wow! I can't wait to get the message in my email that you have posted a new painting! Your work is wonderful! What a good idea for a challenge. It should keep you hopping, and teach you a lot. This first one is great, with the colors, the modeling, everything. Can't wait to see what comes next. Always love new challenges. Wonderful brushwork and vitality it brings to the piece. What an interesting connection you made between food and painting. More exercise, hhhmmm nice challenge and good food for thought. Impressive as usual and a wonderful challenge! Congrats on your weight loss, quite the achievment too!! Great painting Karin, I especially like how you handled the eyes. May the force be with you! 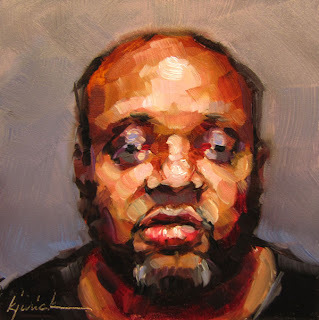 How in the hell (yes, hell) do you do such a great painting in 4" square inches! I just don't get how such wonderful things happen in such a small space. What size brush are you using!! Do you need faces with good lighting sent to you like Carol Nelson did when she challenged herself? Fabulous work! Excellent. Love the greens in here.